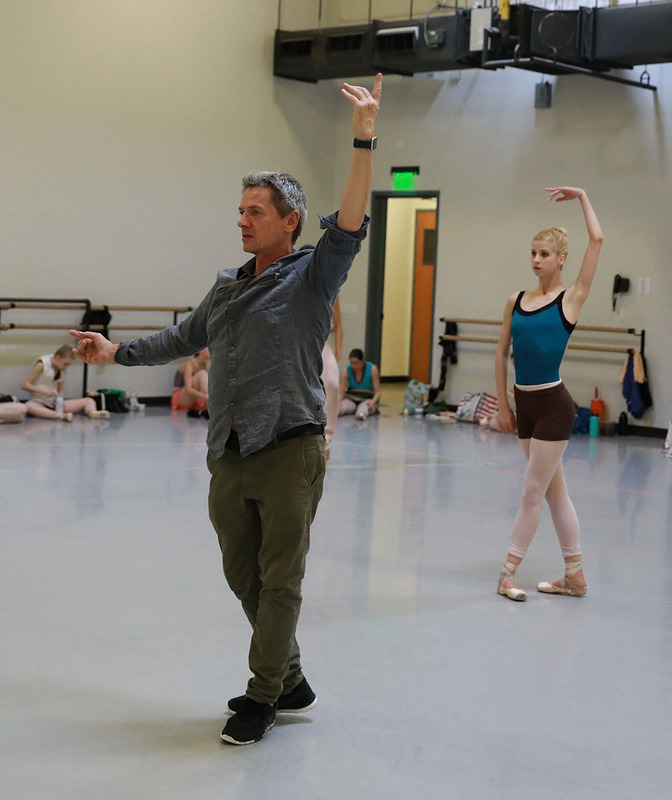 Ib Andersen and Rochelle Anvik in rehearsal for “The Firebird.” Photo by Tzu-Chia Huang. The Firebird is a ballet that is taken from several different Russian fairy tales that were stitched together to create the story as we know it today. It was created for Ballets Russes in 1910 and was Stravinsky’s first ballet. It’s a traditional story of good versus evil painted with big brush strokes so it is very easy to understand upon first viewing. It is a ballet meant for all ages, both adults and children will enjoy it. I’m following the original piece – more or less – the only difference here is that I have placed my version in the future. That’s the beauty of a fairy tale – it can be set in almost any time and place. The Firebird is a mythical creature that possesses tremendous magical power and energy. My Firebird happens to be an alien – it could be said that any creature like this has always been some kind of alien or spirit so my version might be more ‘real’ than most. She is from another planet with different powers and instead of giving the prince a feather she will give him a crystal. This production has been in the making for almost two years. In my initial vision, I had a fairly good idea that I wanted it to take place in the future and I have not really wavered from my initial course. The music is always my inspiration – I have to connect with the music and wherever it takes me – otherwise I just couldn’t do it. To start the visual process, I met with my costume designer Fabio Toblini, and went back and forth with sketches and ideas. We had to start work on the costumes before anything else to allow our costume shop enough time for construction. The next step was to begin work on the sets and lighting. Michael Korsch is our designer for both the scenic elements and the lighting. He has been involved very early in the process. This will not really be scenic design in a traditional sense – it is more like a movie director creating the content for what you will see on the screen – much of it will be abstract. This ballet will be a very different experience from the norm. We are opening up the stage completely and using a huge panoramic black screen (90’x28’) that runs up to the edge of the proscenium and we are lifting the lighting. It will be a very cinematic experience. Michael is essentially making a fifty-minute movie that fits into the choreography happening on stage. We went through minute by minute – what will be happening and what needs to be done. I still haven’t seen the final product yet! This is all unknown territory but I think it’s all going to work out. Choreographing this ballet has been very challenging. I had to be careful to follow the story line so it makes sense; while also including the intensity the music inspires. The score is amazing. I listened to 20 different recordings of The Firebird, and I chose the one by Valery Gergiev, because it made the most dramatic sense from beginning to end. The others felt a little choppy. This is going to be a challenge for the symphony too. It’s such a complicated score. Company dancers in rehearsal for La Sylphide. Photo by Tzu-Chia Huang. Are you having fun creating this from scratch? It has turned out better than I thought. You can say artists procrastinate – but throughout the process you need to leave yourself as open as possible. You often feel unsure, and sometimes your initial idea may suddenly go in a different direction. As long as you continue to follow your vision and don’t decide to scrap it along the way, you will be okay. Your vision has to be pretty solid to make something like this work that far in advance. I can’t really change it now – with these monsters and machine-like costumes. What if I suddenly stopped and thought, man…this really should have been set in a Victorian time period? Why pair The Firebird with La Sylphide? There are parallels in the two stories; so it was a natural fit. The lead characters are creatures or spirits that possess this otherworldly energy. The sylph is also a creature of fiction just as the Firebird. La Sylphide is about inner life and what it means to be human; to dream about where you want to go in life or who you want to be. The sylph represents all of that for James, the Scotsman, as he contemplates destroying his life by not wanting to be tied down by marriage. He becomes completely infatuated with her and her world. It’s a more psychological story than The Firebird. It’s a great ballet and has survived almost 200 years. Ballet Arizona hasn’t performed this since 2004 so it is basically like a premiere in itself. The last time we performed it was at the Orpheum Theatre without a live orchestra.